No matter if you are placing a phone call across the globe to do business or you're calling a friend to catch up on life, you shouldn't have to deal with a connection that's subpar. Sign up for Direct Dial Long Distance with your home or business phone and just start dialing! To make Domestic Long Distance calls, dial +1, then dial the phone number. To better understand our Direct Dial Long Distance and Unlimited International Calling rates, give us, 011 Communications, a call now! No cheap internet phone calls, (VoIP), all international calls include crystal clear connections and 011 Communications have given millions of dollars worth of Free International calls through 2 months free credits since 1989! 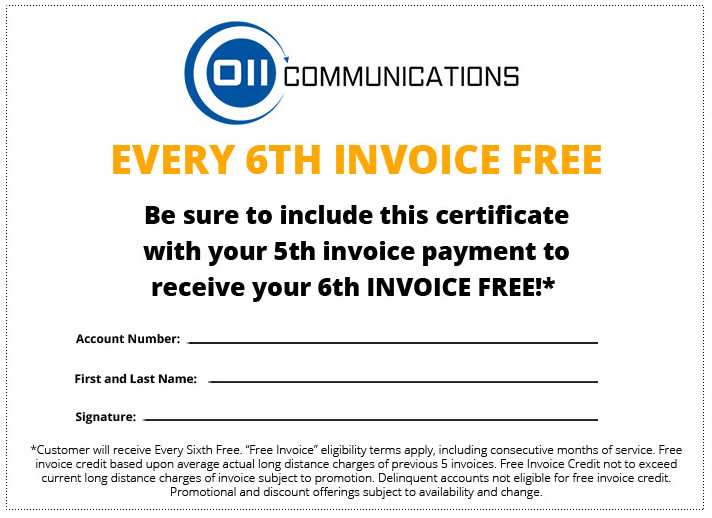 *Free invoice credit based upon average actual long distance charges of previous 5 invoices Free Invoice Credit not to exceed current long distance charges of invoice subject to promotion. **VIP customers also will receive 30 minutes of free international calling to the country you've called the most every month from your landline; and 30 minutes of free international calling to the country you've called the most every month from your mobile phone.